Great music, beer and food at Warwickshire’s own mini ‘Glasto’ in the lovely south Warwickshire countryside! 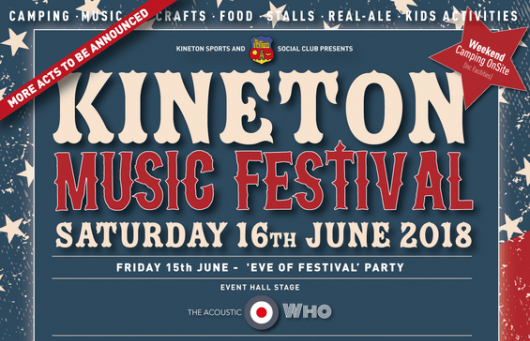 Kineton Music Festival is gearing up for its sixth annual charity fund raising festival after five great years which have seen the festival grow impressively in attendance and establish itself as a key event, both for the Kineton and the surrounding towns and villages. This year’s festival takes place on Saturday 16th June 2018 at the Kineton Sports and Social Club, with a free eve of festival event taking place on Friday 15th June. Ticket proceeds go to our three nominated charities, Myton Hospice, Katharine House Hospice and Warwickshire and Northamptonshire Air Ambulance. To date, we have raised £44,000 for them and would like to make raise this to more than £10,000 this year with your help. Disabled Facilities: Car parking will be provided on a firm, level surface. Accessible toilets will be provided. This was my first visit to KMF and I’ve already booked to travel over to the next one from my home in France in June 2018. Fantastic music (lots of great bands), organisation, food, beer, atmosphere etc throughout the weekend. Even the weather was excellent ! Didn’t try the campsite as I stayed with family close by but it looked great and the campers I chatted to were obviously happy. Our second year at the music festival and another brilliant one. We camped again this year and the organisation was great. Good to see a road marked out this year. The toilets were kept so clean which was great. The music was great a lovely variety. Lots of great stalls and a good selection of food. I have to shout out to the bouncy castle. £3 for all day access was fantastic and the kids had a great time bouncing and sliding. Fabulous as ever, brilliant food this year all well priced and plenty of it! Great breakfasts both mornings. Children really enjoyed the improved activities and although I feel the music wasn’t as good as last year the whole event was a great success. Well done to all the volunteers you make an event like this brilliant. Any musical event brings people together and any that raise funds for local good causes are spot on in my book. Good luck.